Off Wellman Way: Genealogy, Two Full Days And ... I'm Doing It, Again? Genealogy, Two Full Days And ... I'm Doing It, Again? Genealogy has been more than a hobby for me. I've been involved in it on and off for forty-four years. I had a lot of interest in it long before I joined the Church of Jesus Christ of Latter-day Saints at the age of nineteen. I shuffled though letters on my great grandmother's dining room table when we visited Colorado before I was in the sixth grade in Montrose. She asked me not to move anything and she was looking at me in a panic. I was trying to read at a letter upside-down and telling her someone is writing you and I can't read it. I remember asking her, "Why are all the words pushed together." Grandma McKean was writing and receiving letters from her family in what is now Poland and also Germany. All of them spoke German, but she said to me she had wished that they would've written all their letters in French. Grandma was upset and took the letter from me and pushed it down on the table. She said didn't like the Germans. I found-out much later her own mother all of her ancestors were from Germany, but writing her in that particular language upset her. It had to be memories and stories within her family growing-up. Before World War I the Prussians were just starting to raise the taxes on everyone and as a result gaining everyone's land that defaulted on their taxes. Her Grandfather was a wealthy man, but as he grew older, the families knew it was a matter-of-time before all the land and money would be gone. The Prussian officials were angry at everyone and she said everyone went inside their homes when they came around on their big horses. That was something she must've heard because she was very young when she arrived in the United States. A bit of "Kid History," that grew as World War II started. I know that her heart was softened when she made a trip to northern California to visit her daughter, my grandmother. There in the field next to the O'Connor family home were German "prisoners-of-war" picking apples. My aunts and my mother were teenagers and they watched the young men that were their own age pick apples. Mom says they were the most beautiful men she had ever seen. The girls all were sent inside and not allowed to look at them, but my great grandmother baked them something quite German and took a lot out to the soldiers. She spoke to them for a long time and all of them appreciated her and told her they loved America, even though they had to work. On one of the trips back to Colorado, I asked Grandma McKean about the French Language and I wanted to see it. Grandma said that in none of the letters were in French. She wanted me to know it was a beautiful language and they did speak French in her home until the family came to America. A tradition carried from her grandfather Peter Loepp. 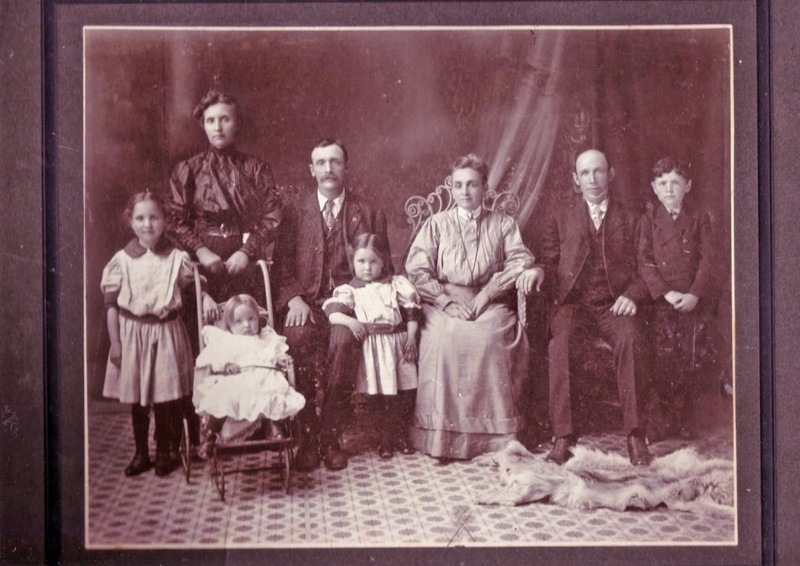 There was a time that the Loepp family lived in an area that was part of France. She said a few words and she looked completely different to me. I'll never forget her face that day. The family's arrival to America was on the Germania Ship. They had a fancy state room and money enough to not only ride the train, but buy a house and farms. I remember her face when I spoke French to her a year later. I took a French class from Mrs. Johnson at Isbell School. Not a popular language in Middle School and I was fortunate to have two years of French. The French class was eliminated after I went on to high school. My Grandma O'Connor passed-away and her mother, Grandma McKean came again to California only this time it was to our house here on the ranch. She asked me what I did in school. A pretty typical question a grandmother would ask and I bought-out my little blue French lesson book and read it to her and I made her cry. I thought I wasn't doing very well and stopped. She told me to keep learning the French, it's a beautiful language. 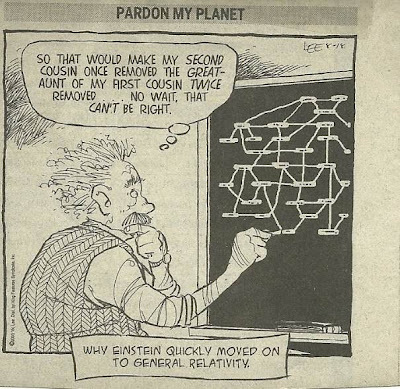 Grandpa Joe was my dad's father and was very involved in genealogy, too. He worked with a cousin and a professional genealogist. He had to actually visit graveyards and write county's for certificates, copy newspapers by hand in the actual cities. My Grandpa was the youngest of the family and ended-up with all the old family papers, the heavy Otis book and all the pictures. I joined the Church and asked him if he was going to will me anything, could it be the papers and pictures? He handed them to me on the spot. My only regret is that he gave me a white box full of letters and pictures of and from my dad, an only child. My dad saw it and I could tell he was very upset that I got them and he didn't. He wanted to look at all of them. I took him the white box. My dad died a short time later and I asked for the box back and no one could find it. I've asked since 1990 and finally my mom, after her stroke and "no hold-back-filter" in her mind, told me she just threw it away with everything else. She went down the list of his Western Wear, his hats, his boots, his junk (pictures and letters) all of it. I went home and cried. I thought of the trinkets she bought and still buys at garage sales and here my dad's memories disappeared and are buried on the mountain. I'm trying to gather so much information right now. I have the upgraded version of Root's Magic. It upgraded right in the middle of my frantic searching and now I'm really learning about the Family Search website. Soooo, I hit a button on "automatic import" to Roots Magic of all the Church has that's connected to my lines. It was a six hour watch of thousands of names, mostly French, coming flying into my database. 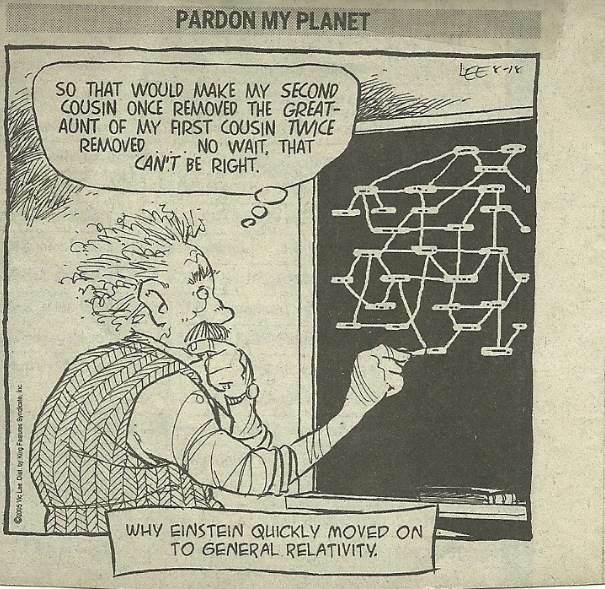 The interesting point here is that two big lines went back to my 8th great grandmother and grandfather. I caught a date on one of those and it was the late 1400's. 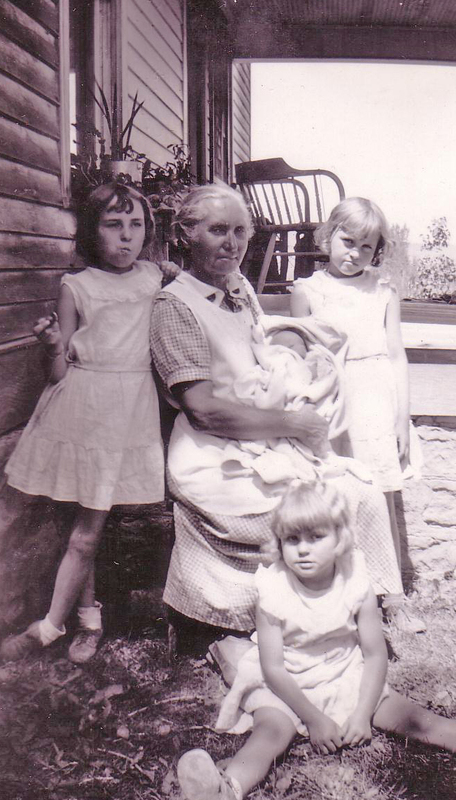 It was my dad's side again, but his mother's line, starting with my great grandmother's mother Julia Charbonneau. grandchildren going to the Temple on Saturday. Family History Center is closed today and well, my husband took the car to work today. This is disappointing. I wanted to fill today with making a dress if I didn't get my paint-remover for my daughter's little cradle. It will be my present to her for my new granddaughter that will be arriving in just four weeks. But .... I can't do any work on the cradle. I made that quick decision after I read the directions before I started the project. I need different gloves and I forgot about the steel-wool to get in the corners and the carvings in the wood. Here again, I hurry-up and wait. I'm going to crack open this "little green book" from Grandma Martha Marie Loepp McKean and see what I can find. One more try before Saturday. Wow! Thank you for sharing your story! I love family history, too. it is so fun to hear about other people's experiences! Thank you! I'm sorry I haven't responded! I just saw your comment just this minute. I've been really, really sick--getting over it and just another bump in the road. But then my daughter was pregnant, we had vacations, parties, I started the grandma knitting,and then she had her baby! In just a blink, here it is October. I'm in shock. I literally abandoned my blog. Hi, Regarding your picture titled "McKean's and Chandler's in Colorado (Loepp). If I'm not mistaken, that would be Meta (Loepp-sister to your grandmother Martha) and Charles Chandler, my great grandparents, so we are cousins! I only have very young and very old pictures of her. That doesn't look like my grandfather Joseph with them, so maybe John. I was trying to find an email link to write to you directly, but was unsuccessful, so thought I would post this in hopes you would see it. Would love anymore information on that picture if you would care to share. Your copy of the little green Loepp-Ortmann families was researched and written by my father, Alfred J. Englehorn. It was what got me started in researching the Engelhorn family following up my father's work after he died in 1983. Is your book "the McKeans and the Chandlers in Colorado" available to another descendant in the extended family? My grandmother was Katie (Loepp) Englehorn. Hi Jim, I know there were other copies sold to many members of the family. I think there was only one sold to our family. I have talked to Loepp’s as far away as So. America and would like a copy of the book. The Loepp Family under David Loepp bought many books. Either he or his son was mayor of Sioux City, Iowa. Since you are a direct descendant of the writer have your copies disappeared? Do you think I should copy mine by taking it apart and copying each page and have the original bound with wire? I’ve thought about doing this so many times, but I didn’t want to do something illegal. I’m not sure any office store would let me anyway. Glad I took a picture of the book. My husband just came home and we might be a week unloading the trailer. Everything is more of a fire disaster than any of us imagined. California brushfires are worse each time. Who do I contact to receive permission to copy the book? I have no idea right now where the other copies are located. I really, really appreciate your comments to me. Thank you.